But as I stepped out to fetch the parcel and rip it open, the joy suddenly drained from me. Shock and anxiety rushed in. Holding the book in my hands, now icy and hesitant, I stared at that cover I adored weeks ago. Doubt fingered my spine. The cover of “Over the Edge” looks glossy and eye-catching, I thought. But is it too like that of “Saddle Tramps,” a previous book? Will it confuse readers? The back cover looked good. But it but didn’t particularly grab me in that emotion-wracked moment. There were typos. Where was the author blurb I’d managed to snag? 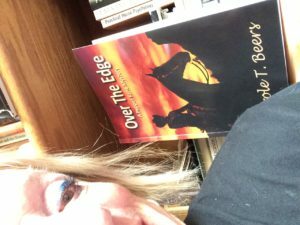 My overall reaction at seeing that proof book of “Over the Edge” — the second title in the Pepper Kane mystery series — was akin to what I’d felt years ago encountering a lost lover. Whether lost deliberately or by chance made little difference. The main thing was, that person meant a great deal to me, wove himself into my life, and then went away, taking a piece of my heart. I never got that piece back. I still miss it — and them, in a way. The attraction remains. But then, so does the pain. Enough so that I’d be stupid to go there again. The nice thing was – and I took comfort in that — I didn’t have to open the proof book, get into heavy editing and light revising, that very moment. It would be there when I was ready. I might have looked at a page or two, the Acknowledgments and Meet the Author. Just to make sure they read all right. They did! I could exhale, at least, about that. In that moment of hesitation, I had a small epiphany. Hey. I could give the proof book to a writing friend who did line-edits on “Saddle Tramps.” A fine author in her own right (write?) and a retired professor, she could have at it first. Maybe by the time she finished, I’d be ready to face it again. It’s been nearly a week now since that proof book hit the porch. Since it practically dared me to immerse myself in it. It’s time for me to take a breath, prepare to revisit my pain. Who knows? Maybe I can also rejoice in the good parts, in the happy times. My friend is done with it. She liked how nicely I reworked the book since she read it in-progress. It’s changed, she assures me. For the best. Finally taking possession of it again, safe on the couch with comfort dogs all around, I gingerly opened “Over the Edge.” I started reading, notepad in hand, ruler on page, inching steadily down while I started my own proofreading. I settled in, beverage at hand, read some more. Odd, how I became increasingly comfortable. I saw both good and sketchy points with a wiser, more objective eye. Read almost as if this were written by another. One with no claim on me, no matter how tentative. One with no stake. Hey, I thought. I can do this. I realized that, like lost lovers meeting again, we can each have our separate lives, run into each other occasionally, yet still have a connection. And, surprisingly? I was good with it. AM good. What’s even better? It’s good. So, readers. I would love to have you join my Beers Review Crew. Whether you know me as a real live person, as Carole T. Beers, Author on Facebook, as creator of the FB group READING COUNTRY, or as boss lady of this website, know that your input is appreciated! I read every review — good, bad or indifferent — very closely, and several times. Readers are my best teachers. But Review Crew members are a cut above. Having read a multitude of books both for pleasure and evaluation, they can, in a few carefully chosen words, teach me and other authors about writing better. They enlighten us about reader preferences or turn-offs in plots, pacing, covers and characters. And talk about wielding power! Having crafted a review, however brief, they can increase an author’s status exponentially. The “magic” number an author needs to get noticed on Amazon is fifty reviews or more. That number puts a writer in the running for free ads and other perks. What author wouldn’t want that?! Remember: Review, hit submit, and let me know about it via email at carolebeers@hotmail.com. That makes you an ex-officio Review Crew member. If you want to hear about and review future books, tell me there, or in Contact on this website. Then, if you live in the U.S., your name will be entered in a drawing for free Advance Reading Copies of my latest books! 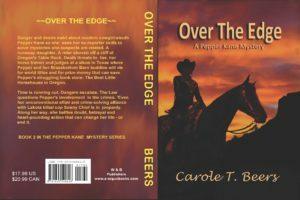 “Over the Edge,” the next exciting Pepper Kane romantic mystery, is due out in early September. Like “Saddle Tramps,” it’s a “page-turning thrill fest,” to quote one reviewer, set in Oregon’s Rogue River Valley. With a side trip to Texas, y’all. 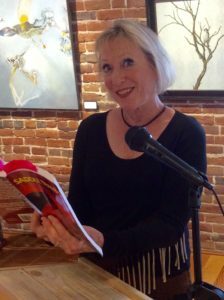 Getting an Advance Reading Copy or a Post Reading Copy (an ARC or PRC) is not “payola.” That’s because these copies of a book, often under edit, are considered proofs that may include typos or other errors. These copies are what professional review groups see. Now. Are you ready to join the Beers Review Crew? Awesome. Go! Why stop there? Double your free fun by subscribing to my blog and newsletter. Find signup prompts in these pages. You will receive not only a warm virtual hug from Yours Truly, but also an occasional update on book projects, thoughts on writing (and life), horsey wisdom, recipes to read by, and lots more. I can’t wait to see you aboard!